I wanted to be able to write game dialogue in Google Docs (from my phone or tablet, or to share with external collaborators) and then automatically send those changes into the Unity project on my laptop. 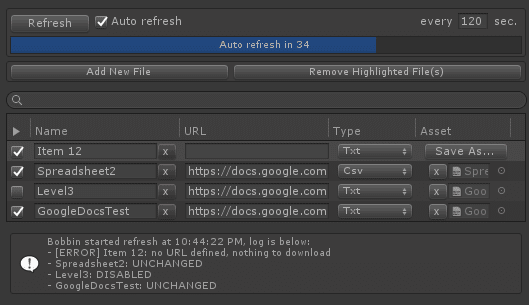 To help me do that, I made a free open source tool called Bobbin, which is a relatively simple Unity Editor plugin that can automatically download the data at URLs, and import that data as a file in your Unity project. Again, it's very simple: every X seconds, it opens a list of URLs (as if it were a web browser) and then it saves all the bytes as a .txt, .csv, .png -- or in-theory, whatever file type you want. Note that this is just an automated download manager, you will still need to write your own game code to actually import, process, and use these files in your game. The main audience for this tool is narrative designers, writers, localizers / translators, and designers / developers who need something fast and lightweight for syncing files with external collaborators. I imagine it also pairs well with text-based narrative plugins like Yarn Spinner, where in-theory, you could collaboratively write Yarn scripts in a Google Doc and then use this tool to automatically bring the script into your game. Anyway, I'm planning on a few more feature updates, like runtime support and/or better Google Sheets support, but personally I'm probably not going to expand the feature set much beyond that. I hope you find it useful! And as always, feel free to submit any bug reports (or small feature requests) by opening an issue on the github.